Anand got the ball rolling as early as the second round, showing some excellent prepration to win with black against Aronian. He went on to win games by accepting Svidler's Marshall and declining Grischuk's in rounds five and seven respectively before finishing off with a victory against Morozevich's Najdorf in round eleven. Aside from the games he won, Anand also showed resilience in defence, surviving a difficult game against Kramnik in round three - how different things might have been if Black had ended up winning that one - and a similar ending against Grischuk towards the end of the tournament. With the exception of the Svidler game, which is analysed on chessbase, all of the links above are to video reports provided by the ICC. 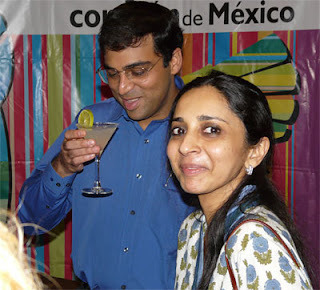 Chessbase have also provided a free file of all the games from Mexico 07 in PGN format. So that's it Anand is world champion and there can be no disputing it ... well not until he squares up with Kramnik in 2008 anyway. Vishy will need to find something against the Petroff and Kramnik will need to do better against the semi-slav. It should be a great match. PS: I forgot to mention I stole the photos in today's blog from chessbase.com too. I should perhaps explain this one a little. I remember being extremely excited, watching this game on television. I was just eleven. It wasn't a game in a book, it wasn't a game in which you knew in advance something spectacular was going to happen. Even if I had, at that age I would still have been excited. I'm still excited now, to tell the truth. But at the time it was the most amazing thing, to see Nunn, who had already put his knight en prise, proceed to fork his own knights. It's funny, it's always that, the self-fork, that I've remembered. So it wasn't until I played through the game when writing this piece that I remembered that he also put his queen en prise as well. Yesterday I began my morning reading Justin's post on unpopular openings. In considering how club players build repertoires of opening variations he wrote, "We tend rather to change than add." Very true, I thought. Well, true for me anyway. If I've learned one thing about chess over the years it's that selection of opening variation is really about the types of middle game one wants to play rather than the sequence of moves with which we would like to begin the battle. Like a Rorshach Inkblot Test, how we respond to a chess position tells us something about ourselves - and not just how good at chess we are. 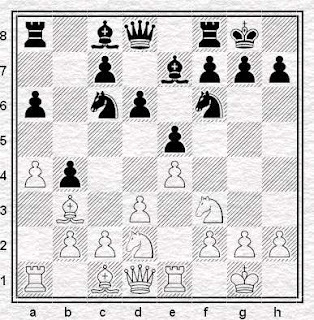 The traits that combine to make up our chessboard tastes are as distinctive as the way we write our names and the personality differences reflected in our relative preferences for, say, IQP or piece activity (the diagram here makes a good chessblot test I think) will be played out in other areas of our lives too. So, getting back to Capote, is this the reason why I've often changed my openings over the years? Is 1. ... e5 Jonathan B? Or the French? Or the Caro-Kann? Which is me? I won many pleasing games in this variation. I played into it hoping to catch my opponents in sharp lines they knew less well than me or, failing that, expecting I would be able to out-calculate my them using a tactical ability I fondly, though probably naively, considered to be my strength at the time. Although it brought me many memorable victories, and wins in the Moller tend to be rather flashy by nature, over time my enthusiasm for the line began to wane. I started to notice that although I would often win against players graded higher than myself, I would also sometimes have accidents against people I thought I should beat easily. I clearly remember the game that finally put me off the Moller and encouraged me to switch to the somewhat less racy Four Knights Opening. I didn't mind too much when Black played ... 0-0 rather than the theoretical ... d6, but 12. ... Ng6 was new to me. It was, I realised afterwards, one of those situations which often caused me trouble - a lower rated player punting an inferior move which I then failed to refute over the board. This isn't best play by any means (amongst other things Fritz suggests 13. 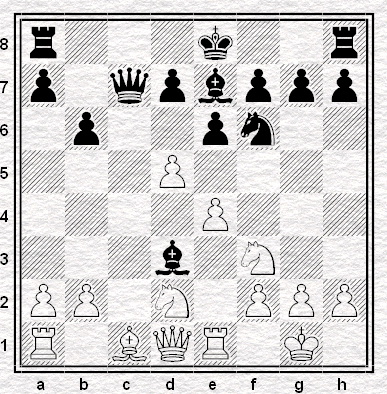 Qe2 [clear advantage for White] and 13. ... b5 [small advantage for Black]), but at the time giving up another pawn to add fuel to the attack looked sensible to me. The problem was I couldn't see how to proceed from there. Unfortunate given that White has a forced win starting with his 16th move. Alas I didn't find it*, played something else and again went on to lose. So, my taste for highly tactical games gradually morphed into the more positional game I now prefer. The Moller was replaced by The Four Knights just as later I would abandon 1. e4 altogether as I headed for the calmer waters of 1. Nf3 - a change, I'm sure, that is not at all unrelated to the process of ageing. Is that, I wonder, ultimately the reason why we club players tend to change opening variations? Is it because we ourselves are always changing? While I’m far too lazy to bother my arse and actually read this piece, Alexander Grischuk may want to have a look. He’s been plagued by time trouble throughout Mexico 07, and particularly so over the past few games. 16 … Qc5 is a new move apparently. At this point the Russian thought for getting on for an hour before playing 17. 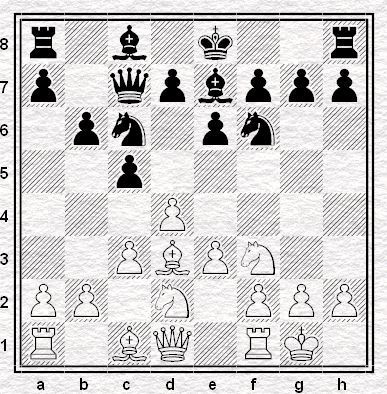 Bd6 – probably the first move that flashed into his head the moment he saw Svidler’s TN appear on the board. Not surprisingly after this mega long think Grischuk then ran short of time and missed a win while scrambling to make the time control at move 40 (which he achieved with just seconds to go). You can find Speelman's video review of this highly entertaining game here. a position well known to theory and, indeed, well known to Grischuk - he’d had it against Anand the round before (losing in 50 moves - see Fedorowicz's video). Here he thought for over half an hour before deciding to vary from …Na5 with … Be6. Unfortunately for our favourite time trouble addict, it didn’t help him any and he went on to lose against Leko too. De Firmian reviews it here. At the end of this interview (recorded just after the Svidler game) Grischuk is asked about his time management problem and what he intends to do about it. As you can see for yourself, his response is to ask for advice. PS: The videos I've linked to are all from the ICC - who are providing a whole range of free stuff relating to Mexico 07. Their website is well worth a visit. I'm not normally in the camp which demands that chessplayers - or any other sportsmen - always attack. 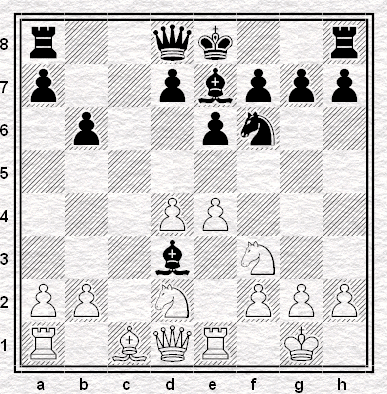 It's a limited view at best- it fails to appreciate how much there is to chess as well as attack. It's also easier to demand from the sidelines than to deliver in practice. Me, I was brought up on Karpov and on Nimzowitsch and on the Italian teams of Enzo Bearzot: and I like intelligent defence, the war of manouevre, defeating the opponent by out-thinking rather than out-calculating them. I like the clash of styles rather than having two tacticians at the board, and I like to appreciate the viewpoint of the player, the particular perspective of the competitor, rather than demand that everybody plays like Shirov just because the fans may wish them to. 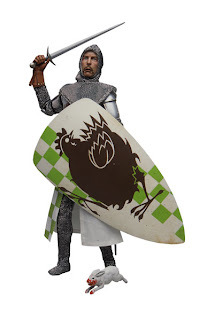 For that reason, too, I've always been fairly understanding of the short draw, of the desire to put off battle till it's necessary, of the choice to stay in the pack as long as you can rather than take the risk that might knock you out of the competition. It's how professionals approach the job, and professionals don't take advice from amateurs. You need to be in the shake-up at the end: take your risks when you have to, in the last two rounds, because if you take them earlier and as a resultm you're halfway down the field, then who will care how admirably brave you were? Fortuna favet fortibus, but sport often does not. It is about winning and world championship tournaments all the more so. That said - why did Boris Gelfand give Anand such an easy time last night? A draw in twenty moves, the Catalan bishop easily swapped off. Black in fact looks slightly better, to my eyes, in the final positon, so perhaps this was discretion rather than an absence of valour, but it's hard to believe that Gelfand went into the game with the intention of putting Anand under any serious pressure. And you might, drawing on the paragraphs above, think that makes perfect sense - he was just half-a-point behind the leader, and he stays that way, tucked in, as it were, with just a few rounds to go. Ready to have a go if anything should befall Anand in the run-in. Maybe. But just for once I wonder if caution was not the wrong option. In the next round, tomorrow, Anand is the only one of the top three to have White - against Aronian. A point (or more) would be a big lead when you are solid as he is. If a half-point behind is as close as Gelfand gets, then he may come to regret that he did not use his White game aganst Anand to try and take the lead. Moreover, and perhaps more importantly - what message did Gelfand give Anand last night? More importantly still, what message did he give himself? Did he not say that he does not think he is as good as Anand, that the best he can do against him, with White, is to swap off the pieces? It's a long, long time since Gelfand beat Anand - never, if my researches are correct, with the Black pieces and not for more than twenty games (and almost as many years) with White. I'm sure that sort of sequence leaves an impression, but it's surely an impression that you have to shake off if you're to win a tournament like this. Chess is a game played in the head and if you don't believe that this can be your week, that just for once, you can beat the other guy, then surely you will not. There's one other thing too. When the professional ensures than he, or she, is in the chasing pack, it's partly because there are more prizes than the trophy to be won. There are livings to be made. You do your best to make sure you win something, and if you do that often enough, then surely, sometimes, sooner or later, the top prize will be yours. But in Mexico City there are no real prizes except winning (unless you're Kramnik). Especially for the Gelfands, the outsiders, the players who have not had a chance before and may never get one again. Presumably, and wholly understandably, that's why Gelfand kept it quiet last night. He didn't want to thow it away. Maybe he'll turn out to be right. But if it slips away from him over the next couple of days, he may find himself thinking that he could have had a go for first place, but lacked the strength, the will, to do so. And the worst position to be in is, surely, the one where you ask yourself what might have been. The ICC have a bunch of free stuff available relating to the Mexico World Championship Tournament. One of the things they're doing is a free video of the day. This link will take you to yesterday's ... which includes several minutes of Kramnik and Leko analysing their game from round five. They don't seem to be talking with each other so much as at each other. Not only that, it kind of reminded me of those old Smith and Jones head-to-heads, an example of which you can find here. Anyhoo, Vishy Anand is now clear out in front at 5/7 at the half-way stage. Gelfand is half a point back and Kramnik is a notch further behind. Is Vlad already out of it? His game with White against Anand in round 10 is now looking like a must-win. Anybody out there think that Kramnik is going to retain his crown? One of the least likely chess book titles you could ever wish to see is “Winning with the Petroff”. Such a book does indeed exist – allegedly authored by one A. Karpov although I doubt whether Anatoly contributed much more to the project than an agreement to the use of his name. Well that never happened and the Petroff is alive and well, appearing four times in the first four rounds in Mexico City. Anand-Gelfand* in round one ended quickly it’s true but had Black played 22. … Rxf4 instead of 22. … Rxe1 with a draw offer he might have been winning. In round three Kramnik emerged from the opening a pawn up against Anand (again) and Leko had to defend a dodgy Queen ending for a hundred moves against Gelfand (again) before the point was split. True, Leko had been better before losing the thread some time around the time control and Svidler-Gelfand (again again) in round four was a typical Petroff short draw but now I come to think about it … what about Brissago 2004 when Kramnik gave Leko a Petroff spanking to open their match. Can the Petroff really have become the way to go if you want to win with Black when playing against 1. e4 at World Championship level??? 1. e4 e5, 2. Nf3 Nf6, 3. Nxe5 d6, 4. Nf3 Nxe4 and now White came up with the not particularly impressive 5. 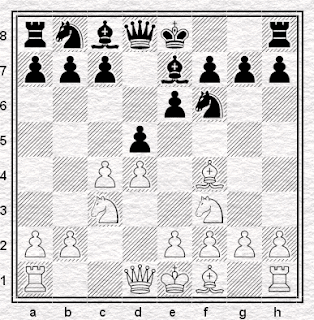 Bc4 to which I responded … d5 and went on to win. Perhaps I should have stuck with it. * Anand punted 5. 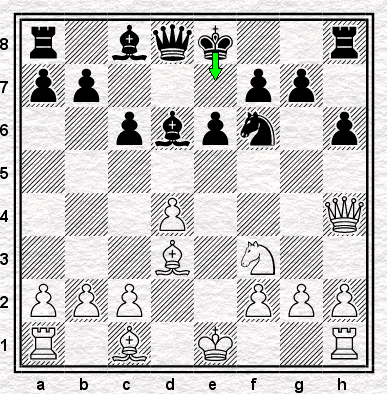 Nc3 against Gelfand though presumably he wasn't hoping to end up on the right side of a six move victory. Thanks for Angus to sending this delightful puzzle by T. Nissl (1910) in to the blog for publication. B. In 2008 Vladimir Kramnik will play the winner of Mexico City unless he wins the event himself. Veselin Topalov as the loser of the last match in Elista will play the winner of the World Cup in Khanty Mansiysk which takes place at the end of the year. The winners of those matches will play for the title in 2009. However if Kramnik wins the WCCh tournament in Mexico City 2007, a match between Kramnik and Topalov, the current and the previous world champions, will take place in 2008. In that case, the winner of the Kramnik- Topalov match will play against the winner of the 2007 World Cup. I think I can just about handle A - but could anybody explain B to me? Over in Mexico it's a rest day. I wonder who's happiest so far. Perhaps not Kramnik even though he's in lead - he's already used up 3 of his 7 Whites so would probably have wanted to be more than +1 by now. On the other hand he did get a draw with Black against his main rival. Any thoughts on how things have been progressing? "Correspondence Chess IM Jerry Asquith has reached the televised part of the BBC quiz Mastermind. His specialist subject will be Alexander Alekhine so tune in tonight at 7.30 on BBC2"
I got that from Speedy Malc's Daily Telegraph column so perhaps I should be a little less rude about him in future. The World Championship tournament in Mexico will, hopefully, help to erase memories of Elista 06 and all that khazi related embarrassment. Not that computer assisted cheating at chess events is a new thing. Mission Impossible were there forty years ago. PS: Mystic Speedy Malc is up to his old tricks again. In today's Sunday Telegraph he confidently predicts the UK - China Chess Summit "will be a tough slog" for the home side. That's the UK - China Chess Summit that ended a week ago in a 28-20 victory for the visitors in case you're not living in whatever Time Zone Malc calls home. Let's end with a sneek preview of the opening credits of a brand new episode of Mission Impossible. Details of the plot are not yet available but the programme is believed to revolve around the likelihood of a poor down trodden chess journalist getting a column published in timely fashion. When I played for my school team, about a quarter of a century ago, I had more triumphs than disasters. Unusually, for me at any rate, I remember the triumphs rather better than the disasters: beating St Paul's (Julian Hodgson on top board) when they'd won the National Schools Championships five years in a row was certainly the best of these, but there were others. More than enough to make up, for instance, for a disaster in the same competition a few years later, when my Hertfordshire school went all the way to Wymondham in Norfolk. Needing just a draw, in the last game standing, to make the next round, our player, a safe piece up, forgot about the clock and lost on time. Having had several minutes to make his last move before the time control. In those days going anywhere in Norfolk was a long, long journey: coming all the way back in the school minibus wasn't just a long journey but an almost silent one. I can, in fact, remember our scapegoat, after a very long a period of accusing silence, bursting out with "I didn't do it deliberately!". I remember his name - I just looked it up on the ECF grading database. There's no-one of his name currently playing. Perhaps the trauma made him give it up. I wouldn't blame him. I never had a trauma quite that bad, but I do remember one game which left me going home holding my head and swearing never to play again, fully able to grasp the full extent of my own stupidity but quite unable to cope with it. Perhaps I realised that if I could play like that at the age of sixteen, I could play like that forever: that this nightmare was going to keep happening. If so, I was right. Of course 29...Rd3 wins trivially, as do a number of moves in the position, but, to prevent a check from the rook, I unwisely played 29...Kf8 first. This wasn't fatal by any manner of means but my opponent, seeing - as I did not - the one tactical opportunity that remained to him, pushed his f-pawn one square forward. I then played the rook to d3, surely winning the bishop since he could no longer play the zwischenzug with the rook. Indeed he could not - but he could and did produce the winning move instead. And filled with anger and embarassment, I went home, not for the last time in my chess life, screaming at myself. I never forgot that one. In more than twenty-five years I've not forgotten it. Although, these days, I'm lucky if I can remember the moves of a just-finished game, I could remember almost the exact details of that long-gone disaster. I looked up the game this evening, as I have retained my old scorebooks, through crises, house moves, even emigration. I thought I was an exchange and two pawns up, but as it turns out, it was an exchange and only one. Close enough: it doesn't matter. And I remembered the name of my opponent, too. As one remembers a curse. It is the nature of curses that they do not die until their work is done. I still recalled, of course, the game and the opponent, but I never thought to come across the name again. But a few days ago, I was reading up on some theory, specifically in the fourth volume of Khalifman's series Opening for White according to Kramnik. 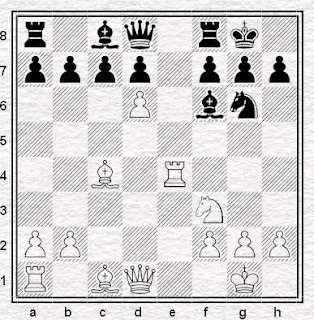 I was specifically interested in the Cambridge Springs Variation and found myself looking at the line which at the start of this piece, which, by a variety of possible move-orders, leads to the diagram immediately below it, a position in which Khalifman recommends that White continue 14.Qc2 with a slight advantage to White "owing to the stong position of the knight on the e5-square". There are a lot of game fragments quotated in the five volumes of Khalifman's work, and one comes to expect citations, if not from Kramnik himself (since it is basically Kramnik's repertoire that we are learning) then from grandmaster games. Normally, that's what we get. Big names. But not this time. Though I wish we did: not for the quality of the play, but because the name attached to Black's side of the board leapt out at me, far larger than that of any expert. Any grandmaster, any champion of the world. The game was Easton-Nendick, Bristol 1990. Bristol. Nendick. NENDICK. That was the name. Nendick. I have remembered that name for over half my life and yet never expected to see it again. Nendick. I saw the name Nendick, like a curse, and I was cursed to remember, once again, how I felt, as a messed-up teenager, two and a half decades before, when I lost impossibly and stupidly, and shook, and went home in a funk, and swore that that I would give up chess. Here's a nice easy one for a Friday. What did not happen - on the board - in the 2006 Kramnik-Topalov match that happened in every previous world championship match? Mexico 70. Banks' save. Pele almost scoring from the halfway line. England wilting in the sun when 2-0 up against West Germany. Brazil's destruction of Italy in the final. I was only two at the time so can't claim any direct experience but still these memories have seeped into my consciousness as I've absorbed the received wisdom of the world cup tournament of 37 years ago as football's Best Ever. I wonder if Mexico 07, which starts today, will be just as memorable. In any event you can follow it on the official site. In the meantime chessbase has lots of pictures in a report on the countdown to the first move and even Speedy Malc is on time today - this thing must be important. Up until now, of course, the chess world equivalent of Mexico 70 is Reykjavik 72. We've already blogged Fischer being awarded the title and an excerpts from a pre-match interview. To get us in the mood for Anand, Kramnik, Morozevich, Leko, Aronian, Svidler, Gelfand and Grischuk let's return to Iceland with a montage of Bobby and Boris (keep an eye out for 2:54). PS: I found this clip on YouTube but EJH points out it was blogged a year ago elsewhere. CHANCE OF PRESENT WRITER LIGHTENING UP AND ADOPTING MORE CHEERFUL ATTITUDE TO LIFE IN GENERAL - absolutely stuff all. What do you think attracts me to chess? Well, maybe, maybe not. But can anybody remind me: during the decade when qualification for world championship matches was in the personal gift of the champion, who was it who invited Vladimir Kramnik to play a match for the World Championship seven years ago when that gentleman had already lost an eliminator to Alexei Shirov? But fortunately, that's not the whole story: the human punchbag fought back - thanks to Michael Basman for that phrase - with Robin managing four draws and the following smashing win against Ian Snape, eventually finishing a respectable 8th with three points from nine games. I have played against Rb8 a few times in rapidplay and as it is not covered in my opening books I never know what to play. So as usual I thought I would make it up as I went along. I did not fancy playing 20 Rd6 as after f6 in reply the White Queen is shut out of the game. This must be better than 20 -- gf4 21 Nf4 or 20 -- Be6? 21 f5. 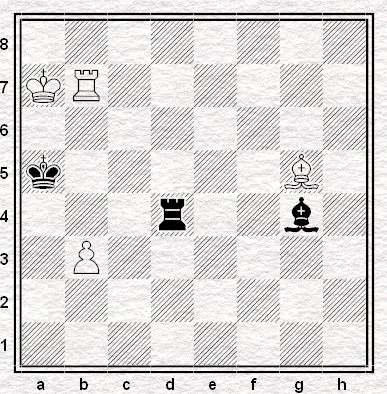 24 Ng3 Rf6 seems to give Black an edge in the endgame. Now it remains to be seen whether White has enough for the piece. 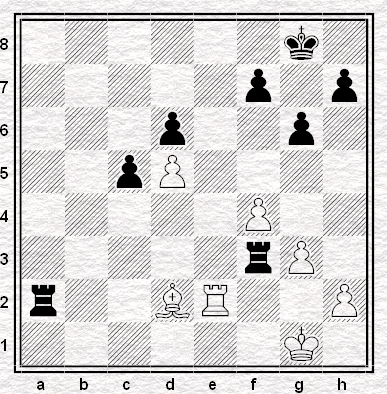 26 Qf6 Rf6 27 Rd1 Rb8 28 d7 Rf8 29 Re5 when I prefer White's position. If 24 -- Bb5 25 Re7 Re8 26 Qg5+ Kf8 27 Qf6 wins. 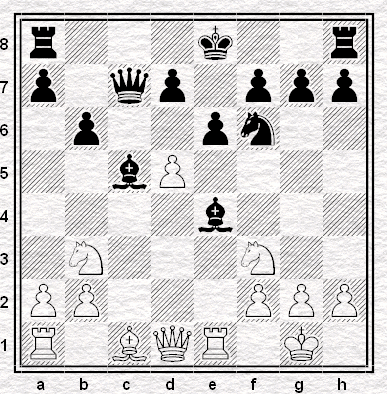 29 Qh8+ Qg8 30 Qg8+ Kg8 31 d7 Rd6 32 Re2 Rd7 33 Rd4 when White is a pawn up pressing for the win. 32 g4 Kd8 33 Ke3 Kc7 34 Ke4 Kc6 35 Kf5 Kd7 36 Kf6 Ke8 37 c4 and White queens on the kingside before Black queens on the queenside. 35. Kd4 Qf2+ 36. Kc4 Qe2+ 37. Kxb4 Qe1+ 38. c3 a5+ 39. 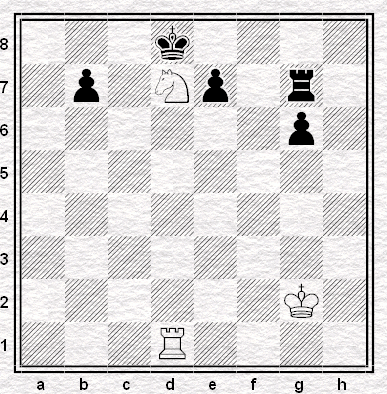 Kb5 Qf1+ 40. c4, resigns. 1-0. Black resigns having run out of a checks. A close game that could easily have gone either way. The tournament itself also seems to have been a success, with Lars Stark achieving his third and presumably final IM norm, Jovica Radovanovic his second. The internet coverage was very good, and you can still find all the details and games played at the above link. But make sure you play through the second game above, before you do anything else. Last week we had Madonna's Ray of Light, this week, courtesy of Angus, we have I Like Trains' "A Rook House for Bobby". Bonus quiz question: Who can identify the game? I think Angus knows. I certainly don't. 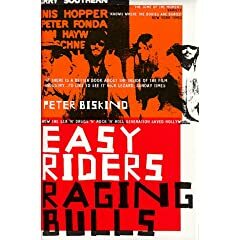 One of the greatest books ever written about cinema is Peter Biskind's Easy Rider's Raging Bulls, which recounts the rise and fall of the great independent American directors of the Seventies, a tale in which death, drugs, stupidity and genius are all on show to an enormously excessive degree in the most extensively-referenced work (absolutely everything is sourced, presumably to ward off lawsuits) that I've ever seen outside an academic journal. 2. The version recalled by everybody else. This blog will maybe take the opportunity, now and then, to examine some of these differences of memory, which - Dennis or Ray could reasonably argue - are inevitable when we are talking about events so long ago, especially when you have taken quite as many drugs as Hopper has, or slept off as many lunches as has Keene. I came across one of these just the other day when perusing, not entirely by chance, the discussion board which accompanies Ray's games on Chessgames.com, which discussion runs to almost three hundred pages, something that you couldn't say of many of his books. So soon after the Staunton Memorial, it's particularly good to see high-class international chess once again being played in England: up in Liverpool, an 8-board UK team that includes Michael Adams and Nigel Short is taking on a team from China. 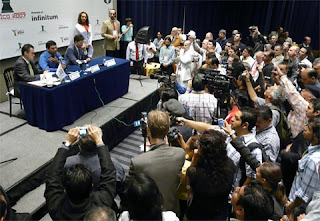 For historical reasons that I have not quite gathered, the event is title The 800th Anniversary Summit Chess Match, and it started on Tuesday and finishes this Sunday. The top six boards will play each other in a Scheveningen format - meaning, each player meets all six opponents once. The other two women's boards will also be a Scheveningen format, but with each playing the other not once but thrice. The full UK team consists of GMs Michael Adams, Nigel Short, Jonathan Rowson, Nick Pert, Gawain Jones & David Howell, and IMs Ketevan Arakhamia-Grant & Jovanka Houska - an average of 29 and average Elo of 2551. With an average age of 20 and average Elo of 2571, the Chinese team consisting of GMs Wang Yue, Bu Xiangzhi, Ni Hua, Zhang Pengxiang & Wang Hao, and WGMs Hou Yifan & Shen Yang, and WFM Ding Yixin looks on paper both younger and stronger. And so far the results bear this out, with China ahead 10-6. You'll remember from Saturday that we were looking at a line that leads to the position immediately above. given by Cox (and others) to see whether or not the delay in developing the c8-bishop is an improvement for Black. 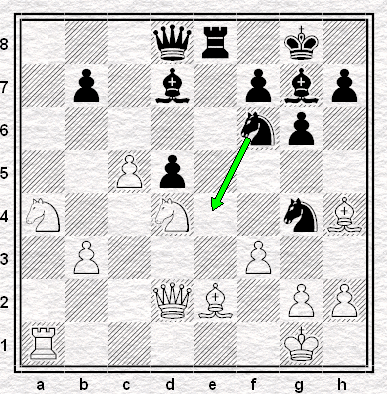 I think it might be, as it appears to gain a tempo in the most crucial line, beginning 8.e4. 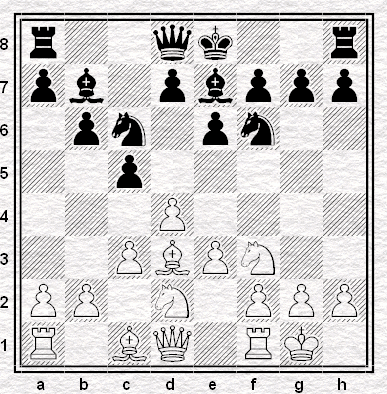 Now it might surprise you that I don't propose to spend much time investigating the alternatives for White on the eighth move: 8.a3, 8.dxc5 or 8.Qe2. This is for a couple of reasons, the first being that this is a suggestion, an idea, not a comprehensive theoretical treatise (I am good enough to come up with ideas, but not, I think, to write theoretical treatises) and the second being that none of them look particularly threatening. Playing the Black side of these shouldn't be so hard - no, really: provided you ask yourself what White is trying to do and take steps to interfere with it. In most cases we can simply play ...Bb7 and transpose back into lines that Cox considers perfectly fine for Black without looking as threatening as the main line we are trying to improve upon. So 8.dxc5 I can't be bothered with at all, it's not a try for advantage. 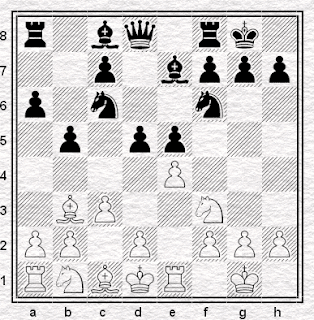 8.a3 prevents the ...Nb4 manouevre that we are going to play if White tries 8.e4 - but it gives us a move for nothing. We can play 8...d5 if we want - yes, I know we were trying to avoid this but White has wasted a move and we have e5 nicely covered. The only way White can try and justify it is with 9.b4 which threatens to drive the knight away from c6 and thereby claim e5 for the knight. White still can't play e4 and while he is trying to organise this Black has plenty of time to organise play against the knight on e5 and/or with ...a6. But for that matter Black could hold back the bishop and play 9...O-O or could permit the e4 idea after all: Cox (with ...Bb7 on the board and the queen still at d8) gives a game Kovacevic-Seirawan* which went 8....a5 9.e4 d5 10.e5 Nd7 11.Re1 Ba6. Provided we think the queen would go to c7, we are, again, a move up on this line. So Black has all sorts of options. 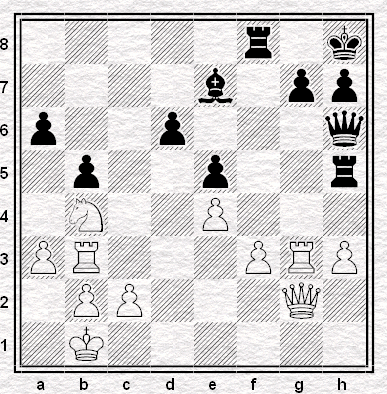 8.Qe2 is also less than frightening as White still isn't threatening 9.e4. Simply 8....O-O and now if 9.Re1 it still isn't threatened due to the ...cxd4, ...Nb4 and ...Ba6 idea so simply 9...Bb7, transposing back into Cox, is fine for Black. which seems at first sight just to put Black a useful tempo (...Qc7) up. However, it's not so simple, because 13.d5 actually includes the threat of 14.d6, which after a capture on d6 wins a piece with a fork 15.e5. For this reason Black (in the Cox line) normally continues 13...Qc8 after which 14.d6 Bd8 is at least a little awkward for Black even though he may be fine after 15.Ne5 Bc2 and an unravelling process involving moves like ....b5. It was in seeking to find an improvement on this that I hit on the idea of delaying ...Bb7, and it's worth mentioning that in extremis Black can always play, however eccentric it seems, 13...Qc8 here too! So, having a transposition available to him, he is definitely no worse off than before. However, it would be nice to actually make use of that extra tempo, and while the queen is on c7 it has the merit of preventing the White knight coming to e5 - as it did in the line cited in the paragraph above. However, it has the demerit of being vulnerable to the same d6 idea as came before, perhaps indeed strengthening it. 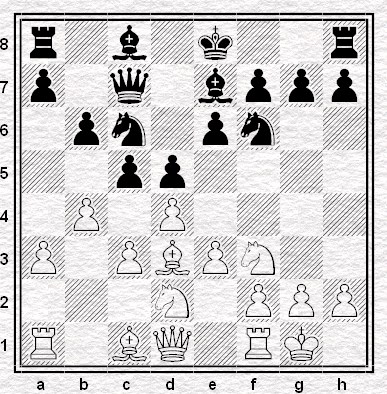 So clearly either the queen or bishop must move, albeit Black could play 13...Bc2 before making the choice. 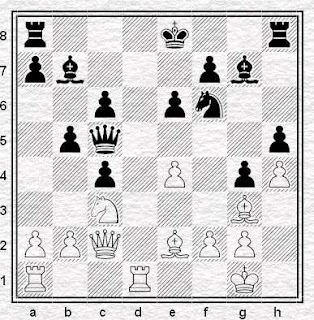 The computer, reasonably enough, suggests 13....Bc5 which has the horrific threat of 14...Ng4 (not to mention 14...Bxf2+ since after 15.Kxf2 Ng4+ 16.Ke2 loses the queen). 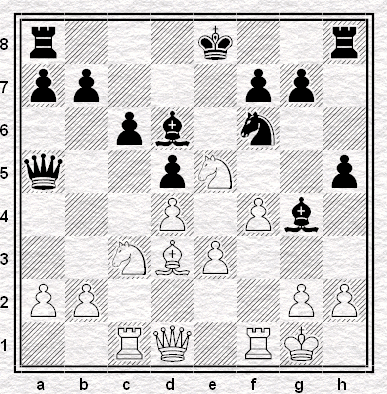 so it suggests further that White play 14.Nb3, allowing Black to win the e-pawn with 14...Bxe4. Now this, to me, is the crucial position. 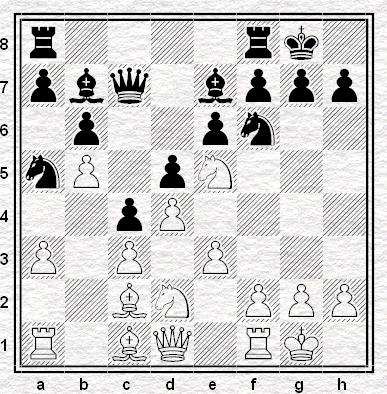 Black is a pawn up, but is uncastled and the e4 bishop is loose. 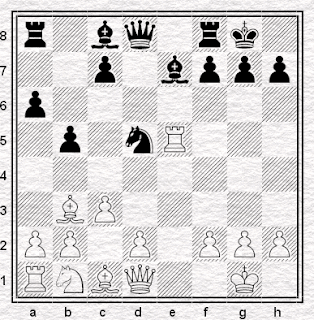 Meanwhile White has a dangerous rook on e1 and is close to completing his development. 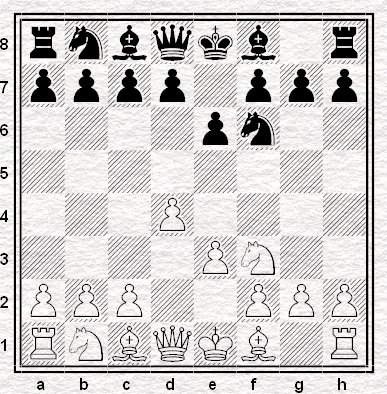 However, the d6 threat has been defused and indeed White is a bit short of centre pawns. Has White got sufficient for the pawn? I'm not that interested in what computers have to say, unless they can offer a concrete line proving the case one way or another. Can they? Mine (Rybka) seems to think White has about half a pawn's worth of compensation, but that's no guide since my experience is that computers normally - though not always - underestimate compensation for material. Indeed it just backs up my gut feeling that this is exactly the sort of position where White might have enough for the material, but in the absence of concrete variations, I'm really not sure. I'm much more interested in what readers have to say. What variations would you try? Do you think White has sufficient? Which side would you prefer to be on? If we get some decent feedback we can have a look at some of the ideas (and then conclude with a look at some move-order issues earlier on in the line). But first, I'd be grateful if you could ask yourself the questions above. What has White got? What can you suggest? 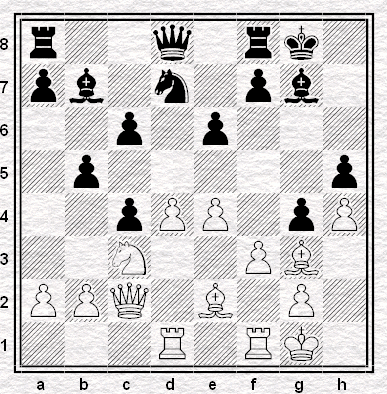 But I shall ask myself the question - would I like to defend the Black position against Robin Haldane? This study by Kubbel has been waiting so long to be blogged, I've forgotten the solution. I did briefly note in my draft, however, that "it's an excellent test of accurate calculation." One I've evidently just failed. That Kirsan Ilyumzhinov claims to have met aliens is no secret. I've read it in newspaper columns, in more jokey spots in the chess press, in passing in critiques of his leadership of FIDE. But there's something about watching him describe it really quite seriously in a television interview that, frankly, brings home how he really means it. And so without further ado, via Chess Buff, here he is. OK Pop Pickers, here's a Madonna video for you. Pay attention around 3:45 or so. Not arf. PS: Sorry for the dodgy quality of the clip. I couldn't find anything better.